Squid joined our family two years ago, can't imagine life without his smiling face! He's so handsome! Gotta love our Coton's. Spanky will be 2 in December. I can't believe he'll be 2! I too can not imagine life without him. Enjoy Squiddy! (Like "Spanky Escobar" on facebook! Squid is so cute ☺☺ Can you please tell us how he got his name. WHATS NOT TO LOVE???? HE IS JUST PRECIOUS. I am going to assume he is a boy who is gorgeous. Yes I to am curious how he got his name. Wonderful picture. 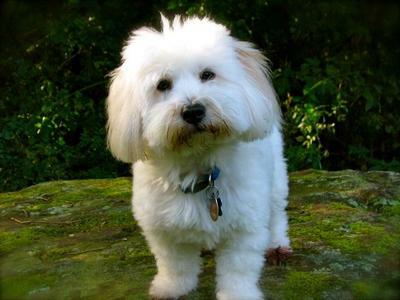 We live in Salisbury MD and have a 4 yr old coton named Sophie. We got her from a breeder in VA but I was wondering if you found Squid somewhere closer? So cute! You must tell us how he got his name. What a cute little guy. I have a black and white named Bentley who is a year old. Love these little dogs. Just love that little face!!!! !